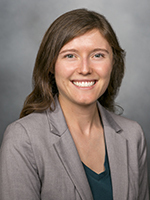 Jennifer Ames, PhD, is a Postdoctoral Research Fellow at the Kaiser Permanente Northern California Division of Research. She researches the etiology of autism and other neurodevelopmental disorders, with a focus on environmental and genetic risk factors. She is mentored by Dr. Lisa Croen. Prior to coming to the DOR, Dr. Ames completed her doctoral training in epidemiology at the University of California Berkeley. Her dissertation work examined the effects of dioxin exposures on neurodevelopment and gene-environment interactions on birthweight. She also holds a masters of science in environmental health from the Boston University School of Public Health and a bachelor's in history and science from Harvard University. The Seveso accident: A look at 40 years of health research and beyond. Environment international. 2018 Sep 01;121(Pt 1):71-84. Epub 2018-09-01. AHR gene-dioxin interactions and birthweight in the Seveso Second Generation Health Study. International journal of epidemiology. 2018 Aug 14;162(Pt 1):55-62. Epub 2018-08-14. Neurocognitive and physical functioning in the Seveso Women's Health Study. Environmental research. 2018 Apr 01;162(Pt 1):55-62. Epub 2017-12-26. Field data and numerical modeling: A multiple lines of evidence approach for assessing vapor intrusion exposure risks. The Science of the total environment. 2016 Jun 15;556():291-301. Epub 2016-03-12. Sewer Gas: An Indoor Air Source of PCE to Consider During Vapor Intrusion Investigations. Ground water monitoring & remediation. 2013 Jun 15;33(3):119-126. Epub 2016-03-12. Building the new schoolhouse: the Massachusetts school building authority. New solutions : a journal of environmental and occupational health policy : NS. 2013 Jan 01;23(2):369-87. Epub 2016-03-12.